Casi (kc) Callaway is from Mobile, Alabama, graduated high school from the last all girls' class of Julius T. Wright and received a degree in Philosophy and Ecology from Emory University in Atlanta, Georgia. She began working in the environmental field as the Southeastern Regional College Campus Coordinator for Earth Day 1990. Casi then began working for Clean Water Action in Washington, D.C. She worked on local, state, and federal campaigns in many areas, including public education, research of political issues, lobbying at every level of government, and fundraising. Before leaving D.C., Casi attained the positions of the D.C. Field Canvas Director and the D.C. Office's Florida Program Director. As Executive Director & Baykeeper of Mobile Baykeeper (formerly Mobile Bay Watch, Inc.), Casi is responsible for coordinating public education; community organizing; research and fundraising. She holds four gubernatorial appointments and serves on the boards of several local, state and regional environmental organizations. Casi is also active in the Junior League of Mobile and with Government Street Presbyterian Church. She and her husband, Jarrett, have one amazing son, Coleman. Justine was born and raised in Mobile and has a deep passion for the city of her birth. After graduating from St. Paul's Episcopal School, she attended The University of Alabama and received a B.A. in Psychology. After graduation, she returned home to serve the city that she loves working as a paralegal on the BP Oil Spill team at Cunningham Bounds, LLC. In 2014, she founded the Leadership Committee of the Young Advisory Council for Mobile Baykeeper and started our Bay Bites Food Truck Festival. During this time, she also held a seat on our Board of Directors. In 2015, Justine joined our staff full-time as the Development Director and holds this position today. As the Development Director of Mobile Baykeeper, Justine is responsible for our fundraising efforts to ensure we can swim, fish, and play in a healthy Mobile Bay. These efforts include membership cultivation, building corporate partnerships, creating and organizing special events, and grants research. She also plays a key role in marketing, communications, and outreach to expand the organization’s mission for clean water, clean air, and healthy communities. She believes everyone in Coastal Alabama has a vested interest in our local natural resources and is honored to work for an organization that has protected the place we call home for over 20 years. She is an active member of the community having served on several local boards and committees for organizations including: St. Paul’s Episcopal School, Mobile United, Mobile Arts Council, St. Mary’s Home, and the James T. Strickland Youth Center. She is a graduate of Mobile United’s Connect Mobile Class of 2016; Leadership Mobile Class of 2018 and Visit Mobile’s I Am Mobile Tourism Ambassador Program. Justine is also an active member of St. Ignatius Parish. In her free time, she enjoys spending time in the community, outdoors, and on the water with family, friends, and her dog Marley. Cade grew up on Guntersville Lake in north Alabama. After earning his B.S. from Auburn University he took a position with the U.S. Forest Service as a wilderness restoration intern in Washington; however, sweet home Alabama called and Cade returned to work on his M.S. at Auburn University. He has completed all coursework and will receive his M.S. upon completion of his thesis. After getting married he followed his wife to her home in Baldwin County and has been exploring the treasures of the Gulf coast since. In his spare time Cade likes to kayak and bike with his wife and snow ski whenever he can. Cade is thrilled to have the opportunity to work for the citizens of the Alabama Gulf coast and preserve the environment of this majestic area. As Program Director, Cade works to make sure that projects Mobile Baykeeper engages in fit the vision and strategic plan of the organization. He is responsible for determining how and when to engage in policy matters to ensure responsible growth throughout the area. Cade manages Mobile Baykeeper's activities in protecting our waterways and communities from pollution resulting from infrastructure issues such as sewage overflows, construction stormwater, and industrial pollution. With assistance from the Program Coordinator and Education and Outreach Coordinator and guidance of the Executive Director and Board of Directors he designs and implements new programs to educate and engage citizens on environmental issues. He also oversees work related to citizen concerns on environmental issues. Astoria Jellett moved to the Mobile Bay area as a child and grew up catching lizards on the beaches of the Eastern Shore. After graduating from St. Paul’s Episcopal School in Mobile, she earned a BFA in Writing with a minor in Drawing from the Savannah College of Art and Design. After a stint as Outreach Coordinator at a specialty coffee roaster, she worked as an instructional designer for the United Nations Institute for Training and Research in Geneva, Switzerland. Shifting to a part-time remote position on UNITAR’s Green Development Programme enabled her to deepen her commitment to environmental issues in Nicaragua. There she worked as Executive Director and later Communications Director of the Selva Negra Community Foundation, which focused on promoting sustainable coffee farming practices. However, Nicaragua’s political instability led to the foundation’s closure and she returned to Mobile, where she was delighted to discover Mobile Baykeeper. With a fierce belief that smaller, local organizations are the most effective at solving problems in all sectors, Astoria joined the Baykeeper team as Communications Coordinator in March 2019. She works with the directors of the Programs, Grants, Development, Education & Outreach, and Membership & Volunteer teams to raise awareness of Mobile Bay’s environmental issues, promote fundraising events, and increase membership. She writes and designs all promotional material, serves as a liaison to local media, and directs the organization's digital strategy through the management of social media, e-mail marketing, the Mobile Baykeeper website, and blog. Laura was born and raised in Scottsdale, AZ, but always knew she wanted to live by the water. She graduated from Dickinson College in Pennsylvania with a B.A. in Environmental Studies in May 2012. After graduation, she moved down to Alabama to work for the Fisheries Ecology Lab at the Dauphin Island Sea Lab. Shortly after, she started graduate school and completed a M.S. in Marine Science at the University of South Alabama in December 2014. Laura has always been fascinated with the water and all that lives in it. She loves to go fishing, kayaking, and snorkeling in her free time. It was not surprising that she fell in love with Alabama's Gulf Coast and decided to call it home. As Program and Grants Coordinator, Laura researches local projects in regard to their environmental impact. She helps carry out existing Mobile Baykeeper programs and designing and works to implement new programs to educate citizens on environmental issues. She also addresses and investigates citizen concerns on environmental issues. Laura is responsible for researching, writing and managing grants to fulfill the organization’s mission. Chad was born and raised in Mobile, Alabama where he spent much of his childhood enjoying the water - either off the coast or on the Pascagoula River with his family. After attending Mary G. Montgomery High School, he spent a few years living in different surrounding states before his hometown called him back. Upon returning home, he attended Bishop State Community College before transferring to the University of South Alabama, where he received a Bachelor of Arts in Political Science with a Minor in Gender Studies. While he was acquiring his degree, Chad interned at Mobile United. He eventually was hired on as a staff member and worked alongside some of the city's most influential leaders and organizations. 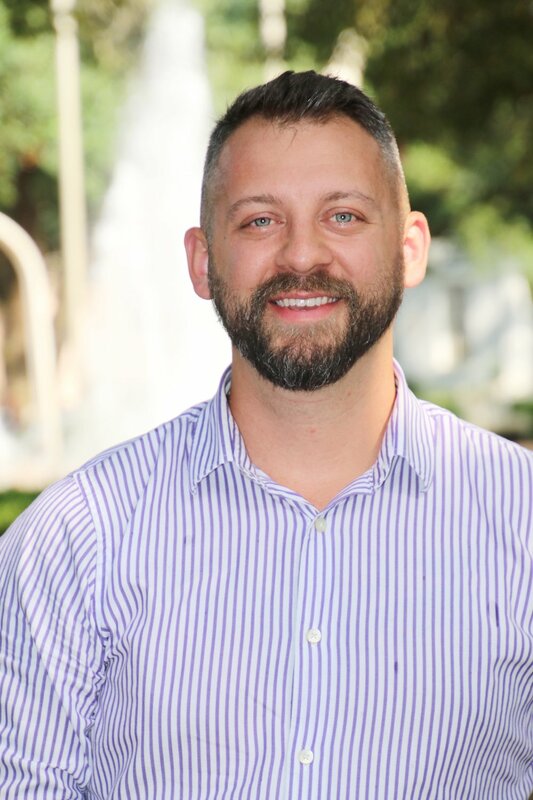 Chad is an active member of the community, serving on the Advisor Board of AIDS Alabama South and helping many people in our area in finding their “zen” as an instructor at Glow Yoga and Mission Fitness. As Membership & Volunteer Coordinator, Chad is responsible for engaging the community and capturing their momentum as members, volunteers, and partners to help the advancement of Mobile Baykeeper in their mission to ensure everyone has clean water, clean air, and healthy communities. He is also the Site-Supervisor for two AmeriCorps Members serving in the Volunteer Engagement Program. In his free time, you can find Chad either in a kitchen, in the outdoors, or with friends. Rebecca Domangue is a Yankee by birth but a Southerner by choice. She has lived in every time zone in the contiguous US in the 15 years since she gave up winters and snow up north for good. Rebecca has a background in biogeochemistry from the University of Alabama but isn’t allowed to say Roll Tide at home since her husband is an LSU fan. Coincidentally, a number of places she has lived Nick Saban has been football head coach at the same time (for Michigan State University during undergrad, for the Miami Dolphins during her MS degree at Florida International University, and of course at University of Alabama during her PhD). Rebecca has worked in environmental research and administration since 2004 and enjoys keeping Mobile Baykeeper running smoothly and effectively focused on the mission, ensuring everyone has clean water, clean air, and healthy communities. Rebecca is responsible for the business operations aspect of Mobile Baykeeper, including budgets, office management, staff training, fiscal responsibility, accountability, and transparency, and operating the organization efficiently. She assists the Executive Director and Directors in managing partnerships within the organization and drives the logistics for events. Free moments find her inshore and offshore fishing with her husband, playing Frisbee with their Labrador, Finn, and knitting. Ilka grew up along the Mississippi Gulf Coast in Ocean Springs. After spending two years at a land-locked college, she transferred to the University of South Alabama and graduated with a degree in Elementary Education. While teaching in the Mobile County School System, she obtained her Masters in Elementary Education from Spring Hill College. She is a consummate educator with 20 years of both formal and informal education experience, including local education foundation programs. After spending 15 years as the education director at both the Exploreum Science Center and later GulfQuest Maritime Museum, environmental education called. As the Education and Outreach Coordinator, Ilka leads education and outreach efforts for Mobile Baykeeper programs. She manages the educational component of Mobile Baykeeper’s Strategic Watershed Awareness and Monitoring Program (SWAMP) and the grants supporting this program. She happily works to develop community partnerships and leads community outreach events. Ilka and her husband live in Midtown Mobile with their daughter, Lina. Their favorite thing to do together is travel. Emilee Foster was born in the Port City, but grew up in Leakesville, Mississippi and graduated from Greene County High School. She obtained her B.S. in International Studies from Spring Hill College in 2018 and began as an intern at Mobile Baykeeper that summer. She jumped at the chance to continue her service to the Bay through AmeriCorps. In her free time, Emilee likes to shop and go to the white, sandy beaches of Coastal Alabama. She also likes to spend time with her family and English Bulldog, Princess. As a Mobile Baykeeper AmeriCorps Volunteer Engagement (Bay AVE) member, Emilee engages the community to increase participation in the protection of our coastal communities. Boris Kresevljak is originally from Hamburg, Germany, but he has proudly called Mobile, Alabama home since he was three years old. He graduated from McGill-Toolen Catholic High School in 2014 and from Spring Hill College in 2018 with a Bachelor of Science. Boris dedicated a portion of his last semester of college to Mobile Baykeeper as a development intern, and it only seemed fitting for him to join the AmeriCorps Volunteer Engagement (AVE) team. You can probably catch him enjoying the beautiful coastal outdoors or engaging with the local community at various events. Kassey grew up along the lakefront of an urban jungle: the Windy City of Chicago, Illinois. Her interest in marine life flourished at a young age, leading to a Bachelor’s in Zoology from Olivet Nazarene University. She followed her passion for wildlife to internships in the Puget Sound and along the Florida and Alabama Gulf Coast. After working at the Dauphin Island Sea Lab, she joined Mobile Baykeeper to educate students on the importance of our watershed. She also guides and educates tourists as a wildlife guide with Wild Native Tours. Kassey enjoys long walks in nature preserves with her dog, Malcolm, attending live music events, and going to the beach. Ryann grew up in Raleigh, North Carolina before attending Presbyterian College, where she met her wonderful husband, Buz. They moved to Mobile five years ago to be close to Buz’s family in Fairhope. Ryann has a degree in psychology and taught preschool for twelve years before starting as an AmeriCorps member with Mobile Baykeeper last fall. She and her family (including Lohi, 9, and Wilson, 5) have been volunteering with Mobile Baykeeper since they moved here. Ryann also volunteers with Big Brothers Big Sisters and is on the PTA Board at Mary. B. Austin. Ryann enjoys running, cycling, yoga, kayaking, and any other chance to get outside with her family. Braxton grew up here in Mobile and spent much of his childhood on Dauphin Island, where he developed an appreciation for the bountiful opportunities and beautiful landscapes the water provides. With a background working with Autism and various developmental disabilities, education and advocacy have always been an important part of his life. He graduated from the University of South Alabama with a major in Psychology and a minor in Business and plans on pursuing further education upon the completion of his AmeriCorps term. As a SWAMP team member Braxton spends his time educating and engaging the community in order to spread awareness about clean water. Sarah is originally from Coronado, California but after graduating from Auburn in 2017 with a degree in Geology, she moved to Fairhope to be close to her family. Having always lived near the water, she decided to focus on it after graduation. She was Mobile Baykeeper’s GIS intern during the summer of 2018, and afterwards became a Patrol AmeriCorps Member. She focuses most of her work on GIS mapping and water quality. When she’s not at work, she is a Middle and High School girls’ lacrosse coach for Lower Alabama Lacrosse. She spends a majority of her time down on the water with her family, her friends, and her dog. Lizzie was born in Georgia but grew up in beautiful Mobile, Alabama. She began serving her community at a young age through Girl Scouts of America, through which she grew to love the outdoors while hiking, swimming, and kayaking. This love of the environment drove her to pursue her B.S. in Biology, which she is currently completing at the University of South Alabama. She is thrilled to continue serving her community with the AmeriCorps Patrol team, and hopes to continue a career in environmental science. Lizzie plans to continue her education by pursuing an M.S. in Environmental Science or Marine Biology. Jamie was born in Colorado Springs, Colorado and raised in lower Alabama, where she developed the utmost love for Mobile. She will graduate from the University of South Alabama with a BS in Geology this year and has served as a NASA JPL Solar System Ambassador since 2016. She discovered her passion for planetary sciences through field camp in New Mexico and utilizes her passion to show young girls their potential in any STEM field. Jamie has cultivated herself not only to be versatile but also unique within her field of study. She hopes to leverage her knowledge and skills gained at Baykeeper to forward future water missions within Planetary sciences. Ellie is from Evergreen, Colorado but calls Mobile home for now. She recently graduated from Spring Hill College where she received a B.S. in Marine and Organismal Biology. She started working with Mobile Baykeeper as a Patrol and Monitoring intern in the summer of 2017. She then stayed on the team as a part-time Patrol AmeriCorps member during her Senior year at Spring Hill. Currently she is a full time Patrol AmeriCorps member and still loving the work she is able to do with Baykeeper. In her spare time, Ellie enjoys hiking and exploring our beautiful delta with her dog, Archer.